Size: 8 ft. tall, 2,500 lbs. 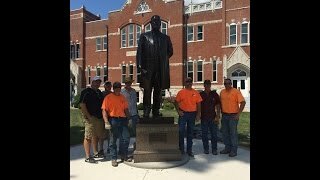 Neumann Brothers, Inc. placed the bronze statue of James Harlan at Iowa Wesleyan College in Mount Pleasant, IA. The statue previously resided in the Hall of Columns at the Capitol Building in Washington D.C. for 104 years. The statue was removed, crated, and transported by Ruan Transportation earlier this summer. 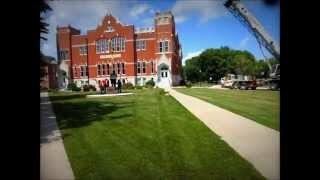 Neumann Brothers oversaw the uncrating, rigging, and installation of the historic statue. The base of the statue is granite and weighs 5,000 pounds. The statue itself stands 8-feet tall, and weighs in at 2,500 pounds.